Steve Wozniak, a San Jose native, co-founded Apple Computer (headquartered in the San Francisco South Bay city of Cupertino) with Steve Jobs in 1976. Many of these facts are contained in Wozniak's autobiography iWoz and in Steve's public profiles. Woz had a Ham Radio license in the 6th grade and was influenced by his father who had a job in an electronics field, and who taught young Steve the basics of electronic components. In a 1995 interview, Steve talks about being on probation for "computer abuse," for orchestrating a variety of pranks, a pastime shared by his future business partner, Steve Jobs. Together they built the first digital "blue box" which allowed them to make [illegal] toll-free calls. Steve Jobs tells the story of the blue box in this video from the Santa Clara Valley Historical Association. The last line Jobs utters in this video is "if we hadn't built blue boxes, there would have been no Apple." Wozniak is a sworn member of the Freemasons, a centuries-old fraternal organization that holds meetings at locations around the world, including San Francisco's Masonic Auditorium. Steve Wozniak is a 1997 Fellow Awards Recipient at the Computer History Museum in Mountain View -- for his "invention of the first single-board microprocessor-based microcomputer, the Apple I." 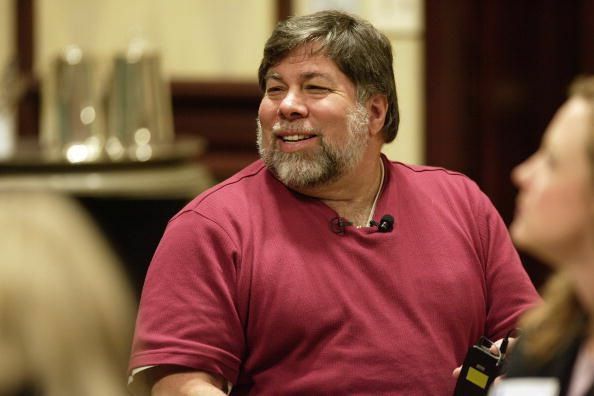 Woz lost his memory after a small plane crash. He couldn't recall the crash, nor could he remember day-to-day events. He credits the power of using logical thought processes in healing and recuperating his memory functions. Steve dated comedian Kathy Griffin, a relationship that was documented on her reality show, My Life on the D-List. Wozniak plays on a Segway polo team, the Silicon Valley Aftershocks. Woz dropped out of the University of California Berkeley in the 1970s but returned in the late 1980s, enrolling under the assumed name Rocky Clark. Wozniak founded the Electronic Frontier Foundation, an organization based in San Francisco that defends free speech, privacy, innovation, and consumer rights. Steve was inducted into the Inventors Hall of Fame in 2000. His official invention listing there: "Microcomputer for Use with Video Display Personal Computer, Patent Number(s) 4,136,359."